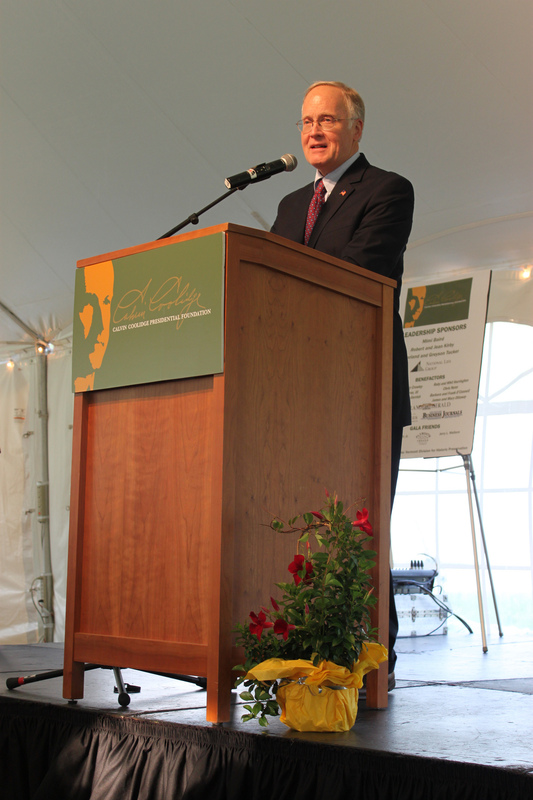 The following is a speech delivered by former Vermont Governor James H. Douglas on Aug. 2 at the annual gala of the Calvin Coolidge Presidential Foundation in Plymouth Notch, Vermont. Plutarch tells how Numa, the Roman emperor, faced with internal dissension among the two races that made up his country, divided the populace according to their trades. Previously, the Sabines and the Romans stood apart, aloof from each other, engaging in endless quarrels and rivalries. Loyalties to race were displaced by loyalties to trade and profession, and the change of allegiance reduced the tensions and the waste of conflict. President Washington warned against the establishment of political parties in his Farewell Address in 1796. It was in response to Thomas Jefferson’s creation of the Democratic-Republican Party, in opposition to the Federalist Party of Alexander Hamilton. Washington predicted that parties would engender a spirit of revenge, causing pain, suffering and “despotism.” A party, he believed, “serves always to distract the public councils and enfeeble the public administration. It agitates the community with ill-founded jealousies and false alarms, kindles the animosity of one part against another, foments occasionally riot and insurrection.” A political party might make sense, he conceded, in a country with a monarch. “But in those of the popular character, in governments purely elective, it is a spirit not to be encouraged.” Of course most nations have political parties these days, but I wonder how different a political system we might have if we had taken the advice of our first chief executive. Vermont history mirrors the national experience in the rise of parties. Washington ruled over a nation of one party, but when he stepped down from the presidency, faction first took root in American politics, as Federalists loyal to John Adams clashed with Republicans loyal to Thomas Jefferson. Vermont’s Washington, Thomas Chittenden, retired after 19 years as governor, in 1797, and party spirit emerged with a vengeance. The state was divided among Federalists and Republicans, and in the elections the following year, where the entire Supreme Court and many other officials were removed and replaced for “no other sin than of admiring the principles of the French Revolution,” Vermont was split down the middle. Calvin Coolidge got along pretty well with the Congress throughout his presidency, but during what he called the chambers’ “hours of timidity,” when the national legislature became “subservient to the importunities of organized minorities,” Coolidge became more assertive, acting, as he said, as “the champion of the rights of the whole country.” He took a broader view of the nation’s needs. Those endowed by the voters with responsibility have the obligation to actually accomplish something, a feat rendered more difficult when officeholders retreat to their partisan corners. “For change to occur,” she wrote, “our leaders must understand that there is not only strength in compromise, courage in conciliation, and honor in consensus-building, but also a political reward for following those tenets. Ralph Flanders was a senator from Vermont in the 1940s and ’50s; he wrote a book after leaving office called, appropriately, “Senator from Vermont.” He believed that the strength of the two parties was their diversity. He enjoyed becoming acquainted with colleagues from different regions of the country with varying views on some of the major issues of the day. Senators of that era were collegial and worked frequently across party lines. After all, it was Flanders who sponsored the resolution to censure his fellow Republican from Wisconsin, Joe McCarthy. Things have changed in the half-century since he wrote this in 1961. I blame the interstate highway for the decline in collegiality in state government. Let me explain: In the old days, when transportation was more challenging, legislators came to Montpelier for the entire session and went back home after it was over. Subsequently, many of us arrived in the capital Tuesday morning before the gavel fell or perhaps Monday evening, to be more relaxed the following day or to avoid the possibility of a storm. Now there are far more commuters; as the state’s population shifted to the northwest, a majority of legislators can conveniently return home each evening. As a result lawmakers don’t dine with each other, don’t socialize as much and don’t develop the personal relationships conducive to working well together on the issues of the day. I always believed that, if you know you’ll be having dinner that evening with a solon of the other party, you might ease up a little on the rhetoric during the day. Congress is now the same. Most members breeze into Washington Tuesday morning and fly home late Thursday. The need for perpetual fundraising and public appearances drives the schedule. George Aiken reported campaign expenditures of $17.09 in his last election in 1968, “mostly for postage to thank people for circulating his nominating petitions, which I didn’t ask them to do.” That wouldn’t happen today, even if a senator is unopposed. For years Senator Aiken had breakfast with Mike Mansfield, the Democratic senator from Montana and majority leader. They were the best of friends, regardless of how they voted. That kind of relationship is regrettably rare these days. To be sure, everything is relative. The degree of civility in political discourse in Vermont is greater than in other places. That’s probably a function of our size. My dinner thesis extends to life beyond Montpelier: If you know you’ll run into someone at the grocery store or school play, you might exercise restraint in criticizing him publicly. A troubling demographic trend is contributing to the growing grumpiness in American politics. It’s part of the national polarization that is not conducive to maintaining a civil, pluralistic society. Some Harvard researchers presented a theory they call “ideological transmigration.” They posited that, increasingly, people want to live in communities with those who think the same way they do. As a result, some states are becoming a deeper shade of blue and others a more brilliant red. Half the states now have Republican governors and Republican majorities in both legislative chambers; in a quarter of the states, the Democrats are similarly dominant. In only a quarter is there divided government where, presumably, the parties must work together. A new Pew Research study concludes that the nation is more divided ideologically “than at any time in our recent history: The percentage of Americans who are hard-core liberals or conservatives has doubled in the past decade. We must blame some of it on talk radio and cable news, writes Charles Blow in the New York Times. “Profit-driven provocateurs” get ratings and make money by stirring up passion and demonizing opponents. In these echo chambers, he says, there’s no room for nuance or dissent; the mere hint of moderation is considered a betrayal. Bruce Stokes of CNN says that this partisan paralysis endangers a central premise of democracy and has “profound implications for the rest of the world.” When the planet’s sole superpower can’t achieve consensus or adopt consistent policies on major issues, whether economic or security, we have inaction and confusion. The lesson here is not to be thin-skinned. Coolidge declined to attack his adversaries. He learned this from his mentor, Massachusetts Sen. Murray Crane. Of him Coolidge said, “He confirmed my opinion as to the value of a silence which avoids creating a situation where one would otherwise not exist, and the bad taste and the danger of arousing animosities and advertising an opponent by making any attack on him.” It’s not easy to restrain yourself in the face of harsh criticism, but Calvin Coolidge provides a glorious example. What we really want, of course, is a government that works. Increasingly Americans are concluding that Washington is broken. I was on Capitol Hill a few weeks ago; it was a scene that was surreal: lots of well-dressed people with briefcases, folders and smart phones walking briskly and purposefully through the corridors of power appearing to be rushing somewhere to do something really important. These are the same people, of course, who have been unable or unwilling to even pass a budget for the past four years and who continue to create crises, solve them at the 11th hour and then expect us all to be grateful and relieved. A host of reforms have been suggested, but I believe that only two would make a significant difference. The first is changing how congressional districts are drawn. Gerrymandering is the process of designing some of such a bizarre shape that it’s obviously an effort to create a constituency favorable to a particular party or candidate. It takes its name from Elbridge Gerry, governor of Massachusetts two centuries ago, who was in office when the state Senate districts were drawn in an extremely contorted way. Gerrymandering has contributed to the polarization of the country. Someone observed recently that we’re a 50-50 nation, but we have 90-10 districts. Very few seats in the United States House are competitive: they’re crafted by state legislators to favor the candidates of their party. If politicians draw the maps, the results will be political. Some states have created independent bodies to design the districts; better yet, there’s the Iowa system, where it’s done by a computer. A dispassionate, impartial, nonpartisan redistricting process would make a tremendous difference by eliminating all those safe seats. It would force candidates and, later, officeholders to the political center. Secondly, I’ve long opposed term limits for public officials. I’ve bought into the oft-used argument that “we already have term limits: they’re called elections.” It’s a snappy line, but incumbents almost always win re-election if they seek it. Less politically motivated redistricting would help, but not in the U.S. Senate; indeed all officeholders have great advantages over their challengers: they can churn out press releases, deploy their large staffs, distribute federal grants that add to our huge debt and attract far more campaign contributions because donors rightly assume that they’ll probably prevail. Those who spend money on candidates like to give to winners. In the past two years, since the Congress last faced the voters, 30 percent of Europe’s monarchies have installed new rulers on the throne. By contrast, only 17 of the 435 House seats will be competitive this fall. Even if you add those who are retiring, resigning or have lost their primaries, the Congress doesn’t come close to matching the turnover among the hereditary kingdoms of the Old World. Rather than address the stasis in the federal government today, each side blames the other. In fact, of course, they’re both right. How can those who’ve been breathing the stale, partisan air of the national Capitol possibly succeed in forging the alliances that Senator Flanders found so essential to address the nation’s challenges? I understand the arguments against term limits; I’ve long asserted them myself. But when a recent poll concluded that the American people are more comfortable with a colonoscopy or head lice than with the U.S. Congress, something is terribly wrong. The performance of our federal government could hardly be any worse than it is today, so I’m now willing to give term limits a try. Most of the nation’s governors are term-limited, and 35 of them have been in office less than four years; in 2010 several controversial new Republicans were elected and they began to ruffle a lot of feathers. One was even subjected to a recall effort. There’s a big difference, though, between these new governors and the folks in Washington. The governors are doing what they believe is necessary for the well-being of their states; whether you agree with them or not, they have the courage of their convictions and some really don’t care if they’re re-elected. Conversely, in the Congress, it’s all about re-election. That’s why they dole out earmarks and grants, currying favor with their constituents while dispensing trillions that we don’t have. Other nations are wondering what’s going on, and a major credit agency has downgraded our rating. I doubt we’ll return to the days of Washington, who shunned political parties, or John Quincy Adams, who scorned them. The latter observed that “the country is so thoroughly given up to the spirit of party, that not to follow blindfolded the one or the other is an [unforgiveable] offense.” I’m not sure we’ll retreat from party allegiances soon, so we might as well try to make the process responsive and constructive. What we need is more moderation. We need to calm down. We need to see problems not as crises, demanding immediate action and large expenditures, but through a different lens. We need to think more about history, and its sweep and rhythms and textures. We need to do more thinking and reasoning, and less talking and wrestling. This is what Calvin Coolidge did best. They made fun of his quiet. They made jokes about his silences. He was neither glib nor easily moved to passion. He understood faction and turmoil and hard feelings, but he saw beyond that, and the country was better for it. It’s an unsatisfying time in our nation’s political history. We seem angry as a society and polarized. Disagreements are as old as America itself, but we need to honor the legacy of our founders and make democracy work. We have an inspired example of how to succeed, offered by a simple man from this picturesque hamlet. If every American were to study his life and times, perhaps the future would be brighter for the nation he served and loved.